Callum MacPhee spent four years between the pipes for the men’s hockey program and was one of the best goaltenders ever to don the ‘green and gold’. 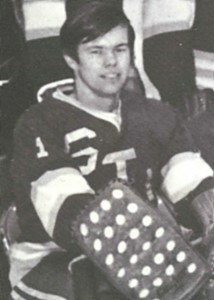 In his four seasons with the Tommies, MacPhee was named the team’s most valuable player in 1967-68 and was given male athlete of the year honours in 1969 and 1970. In 1969, the Tommies lost in the Maritime Intercollegiate Hockey League championship final despite MacPhee making 38 saves. The netminder was named tournament most valuable player. In the same year, MacPhee was named an MIHL all-star for his 641 saves and .899 save percentage. The Chatham native was a member of the Tommies team that represented New Brunswick at the first Canada Winter Games in Quebec City. MacPhee also played four years for the Tommies soccer team.